The signs were up in preparation for an event the next day, sponsored by Kate’s Club, an organization that helps grieving children honor the memories of their loved ones who have died. 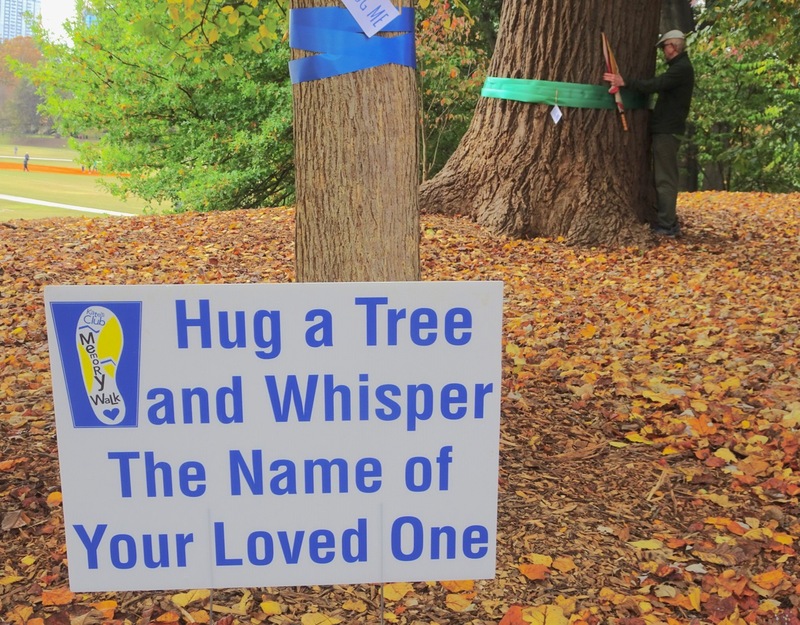 And who could resist a tree with a “Hug Me” sign? We have absent loved ones, too, so we took the opportunity for some tree hugging. And yes, we also love trees, so there was some dual purpose hugging going on. 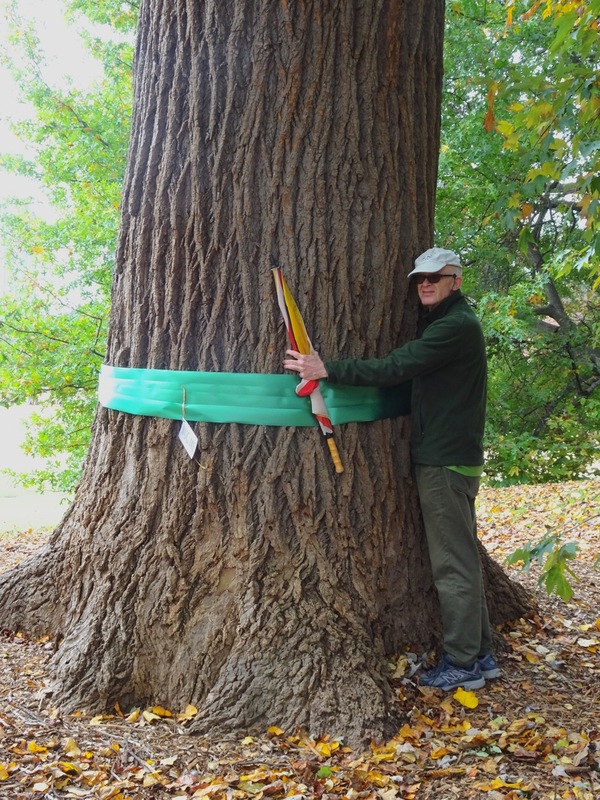 Treehugger in action – Piedmont Park – No trees were harmed in the making of this photograph. 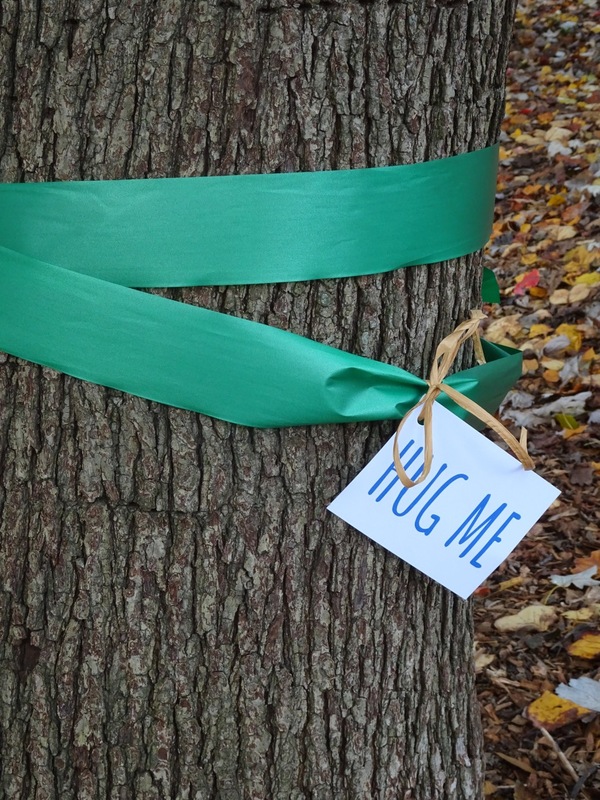 There are other, perhaps less poignant, reasons for tree-hugging… when I left my house in Kansas City to move to Georgia, I had my own parting ceremony. 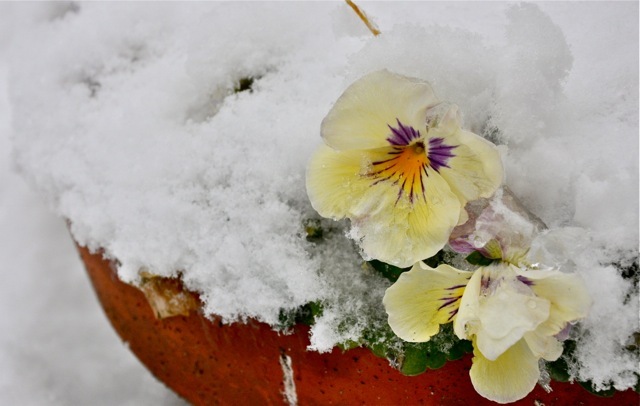 It was January 1, the start of a new year, and I was leaving for a new city. I walked all around the yard in the snow, taking a circuitous path to hug each of the trees good bye. Those trees were a large part of the reason I bought the house, and it was hard to leave them. I would have hugged the trees when I sold my house here too, but the frantic rush of last-minute packing left me with no time to spare. Do you suppose the new home-owners would notice if I came sneaking over sometime and hugged their trees? *tree hugger — A slang, sometimes derogatory, term for environmentalists; someone who loves the environment and believes it needs to be protected for the benefit of ourselves and generations to come. More on Kate’s Club; the Memory Walk is held in coordination with National Children’s Grief Awareness Day. After that, I made a stab at clearing my closet. I can’t do the Marie-Kondo thing and take everything out of all closets at once, there’s too much, but I thought I could take out a bit at a time. Then when I’m down to a manageable amount, I can consider her recommendations from The Life-Changing Magic of Tidying Up. I can’t complain about Bob for keeping his tickets because… in the closet, I found my collection. The best I can figure out is this: We both loved traveling. We loved the world, and the way that working for the airlines opened it up to us. I think it was a way — however misguided — to remember where we’d been, a time capsule that we’d open someday and look back on, like I just did. 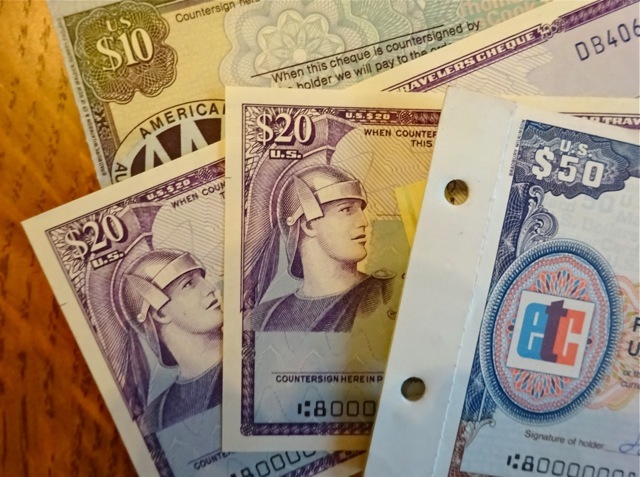 It seems related to the urge to save old passports for the stamps. So in a way I did Marie-Kondo the ticket sleeves — with the synchronicity of finding both batches, I took them all out and went through them, admired them, and moved on. Gotta admire the helmet on that Centurion too. It’s not the first time I’ve found unused travelers checks when closet-diving. It’s nice to have a little reward for my effort, and money always “sparks joy”, right? 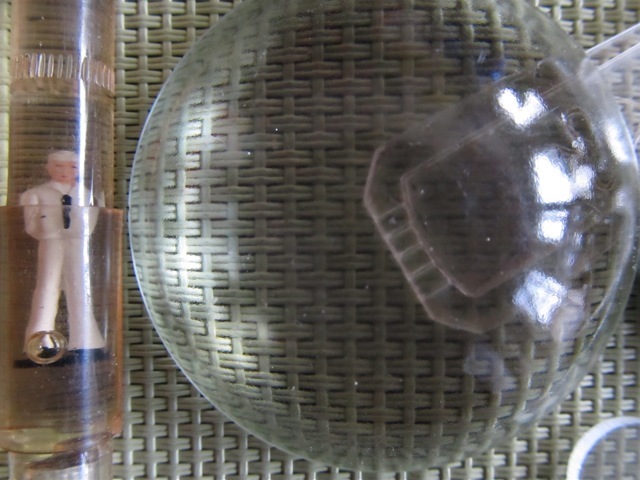 It also reinforces my resolve to keep looking closely when I sort things, rather than just chucking out the lot. And I’ll be sure to use the money for experiences, not stuff. Here’s a funny thing — those ticket sleeves? People sell them on eBay. (I had to look) Will I try? Maybe I’ll give it a shot. But would Marie Kondo mess with eBay? Probably not. 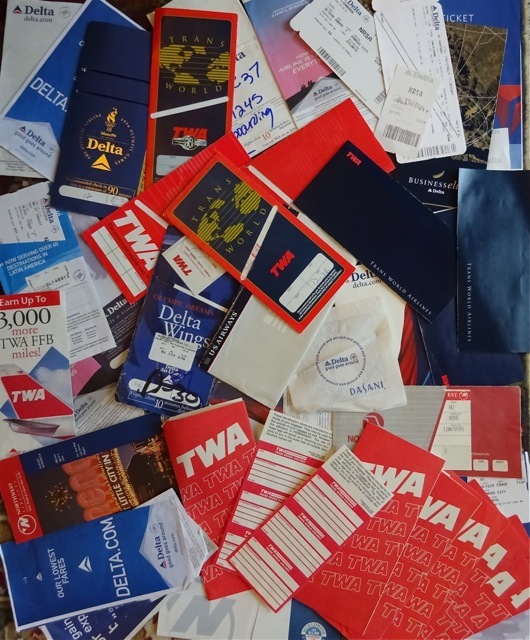 Do you keep old passports, or other trip souveniers? 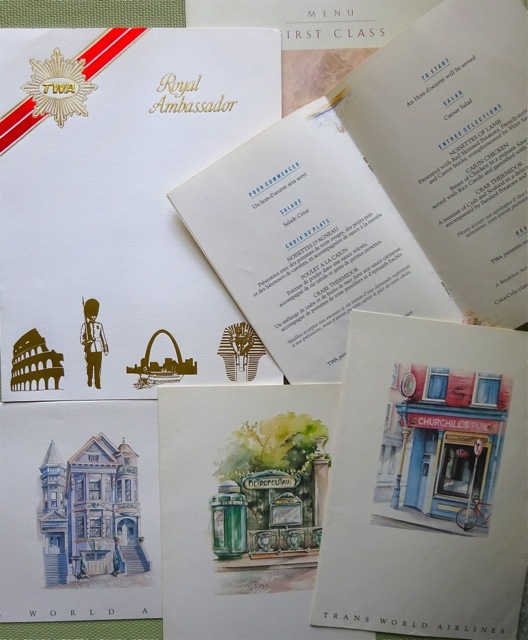 Unpacking yet more of Bob’s boxes in the last few weeks, I’ve uncovered a trove of airline menus from past flights in 1st Class. Seeing these, I could say his muse was food. 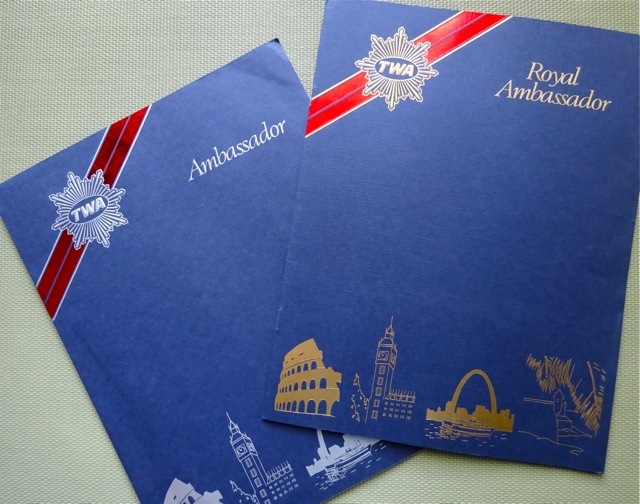 When these menus were new, we were airline employees, with pass riding and upgrades as part of our benefits. Before flights were packed as full as they are these days, we often got upgraded. 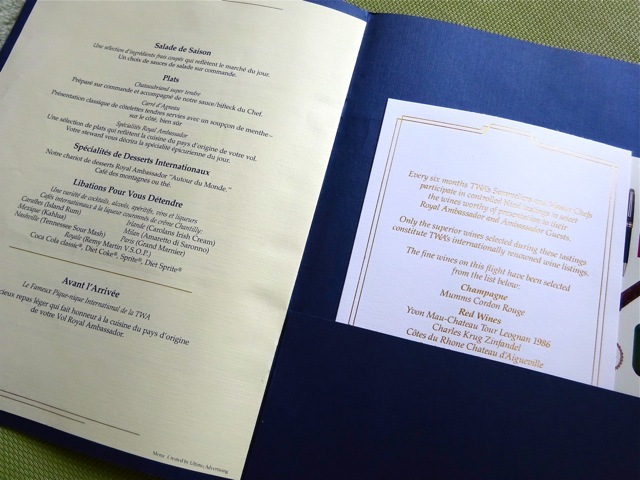 When menus were shiny — I don’t remember the difference in Ambassador and Royal Ambassador. Apparently it had to do with silver and gold. Or maybe it was the upstairs/downstairs of the 747’s. Before I had Bob to travel with, I seldom stopped to eat in nice restaurants, but instead found a cafeteria or a grocery store, or got a sandwich on the go. Seeing these menus reminded me of our first trips together and how amazed I was at the time he was willing to invest in deciding where to eat. Our first international trip together was to Greece, and I remember walking up and down and around all the streets near our Athens hotel that first evening, waiting (and starving) while he read the menus in the windows and deliberated, sometimes going back to look again and compare. The libations were shiny too. A selection — I’m guessing through the 1980s. 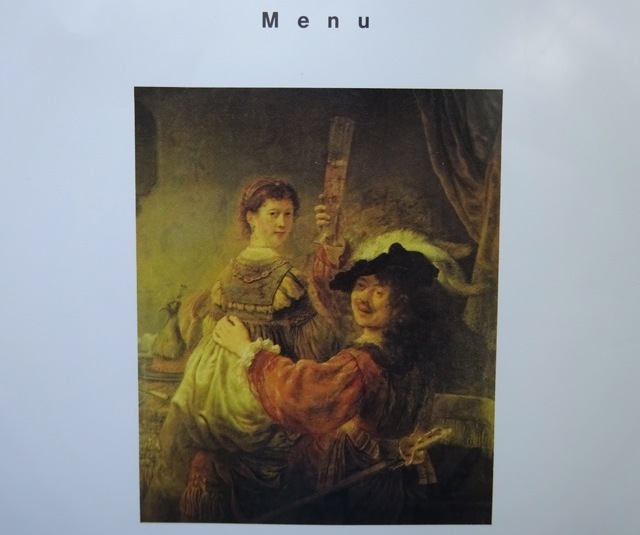 KLM Menus were a class act, and by the looks of it I’m guessing there were libations involved here as well. Years later, in New York City for his cancer treatments, Bob lamented that there we were, in Manhattan, surrounded by wonderful restaurants, but chemo made him too nauseous to feel like eating. That soon changed though. After his surgery and through seven years of subsequent visits for check-ups and treatments, he got to enjoy those restaurants many times. I remember now that when I first started sorting through things after his death, I found stacks of menus then too — from his New York favorites. But one more thing. I’m not so innocent myself. I found a menu that I saved. 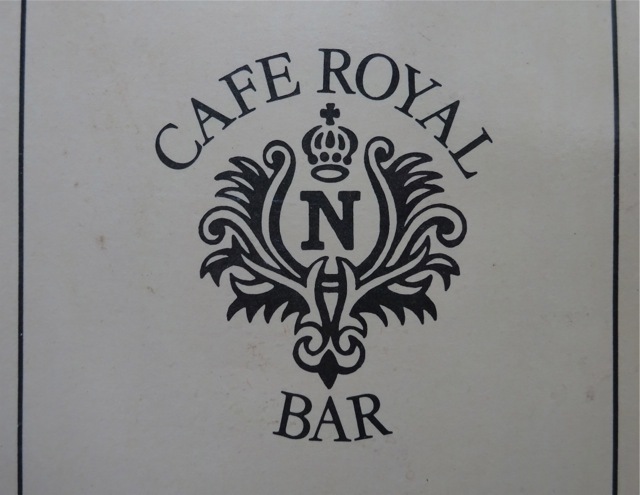 My friend Donna and I went to the Cafe Royale in London just to get this one. It had something to do with our favorite sci-fi novel of the moment, a Michael Moorcock time travel fantasy, where the raucous aliens partied in the bar of the Cafe Royale — picture the bar scene from Star Wars set in Victorian London. 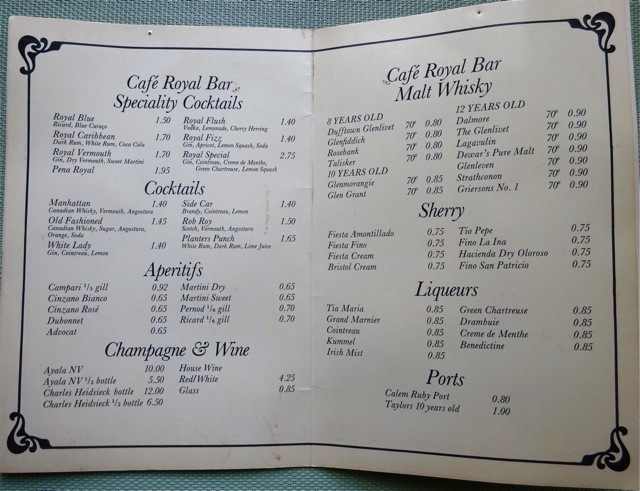 Cafe Royal Bar – you can tell from the prices that this was some time back. What to do with the menus? Maybe I’ll check out eBay. 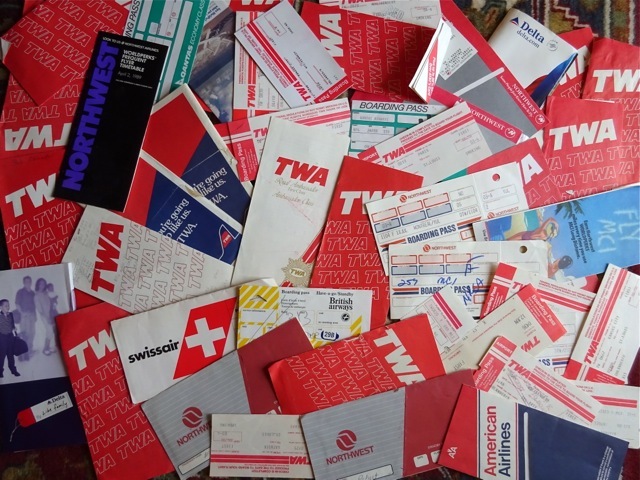 I did notice not long ago that someone was selling a TWA seat-occupied card. And yes, I have one of those too. Have you ever collected menus? 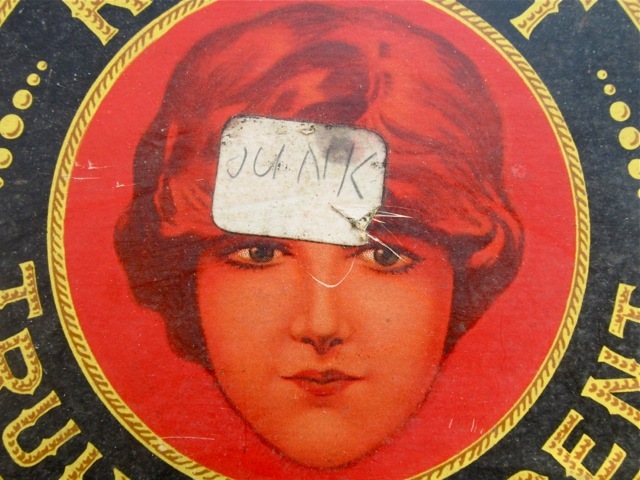 Mining the basement: in the depths of a box full of miscellaneous stuff, I found a cigar box labeled “Junk”. It was nestled under a leg from a long-ago chair, a bunsen burner, and a selection of yo-yos. Out of the depths of the basement… I recognize Bob’s printing. 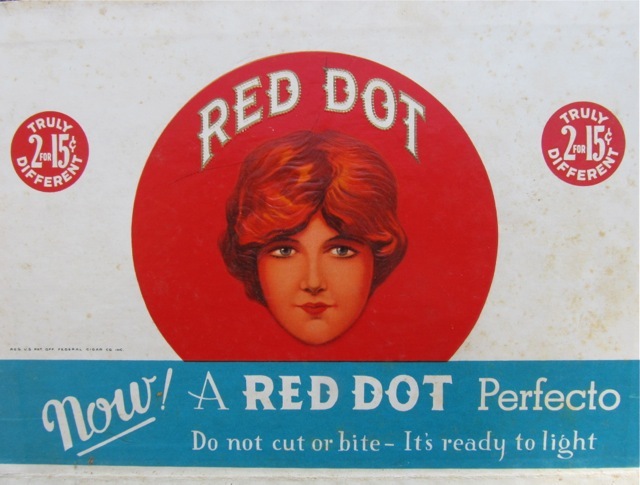 What big eyes she has… and yes, it’s clear that I’m overly fascinated with vintage illustration. I didn’t find an attribution for this artist. I’d say it’s not fair to publicize what someone kept in a junk box or drawer, but in this case it’s so much more interesting than anything to be found in a box of mine that I don’t think Bob would have minded. 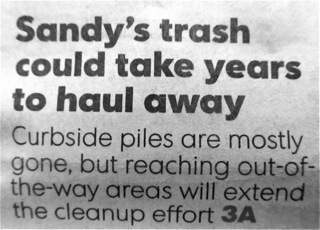 Maybe one man’s junk can be someone else’s treasure. I’m not sure about this little sailor, but I think maybe he’s a level. A little research told me it would have come in a Ralston cereal box, a toy associated with a Tom Mix radio program that Ralston sponsored in the 1940s. The original Tom (1880-1940) wasn’t part of the radio program; he was a silent and sound cinema star in early 20th century westerns who made over 100 films. 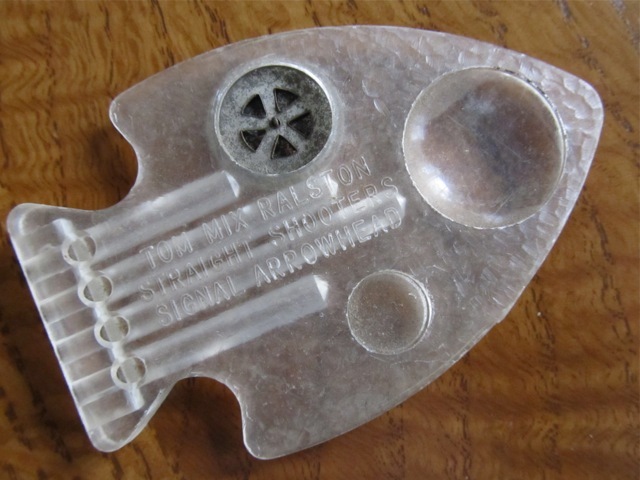 This “signal arrowhead” is complete with a magnifying lens, a reducing lens, and (purportedly) a whistle and pipes, all of which a young boy scout would need to be prepared. It was tucked into the box along with several Scout badges, a touching testimonial to a happy and adventurous childhood. 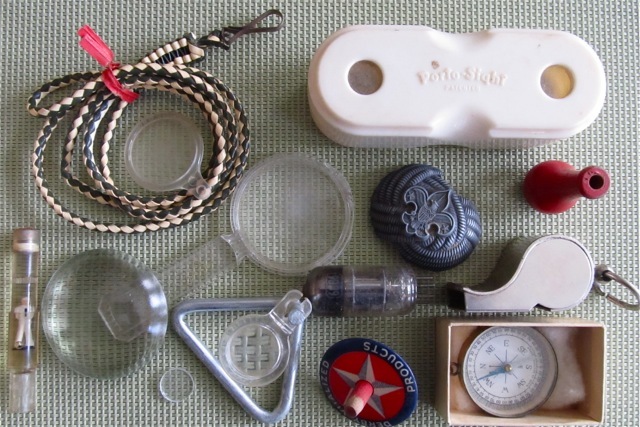 Over to you now — what’s in the depths of your “junk” box? And what can I do with these things? Where have all the Browncoats gone? 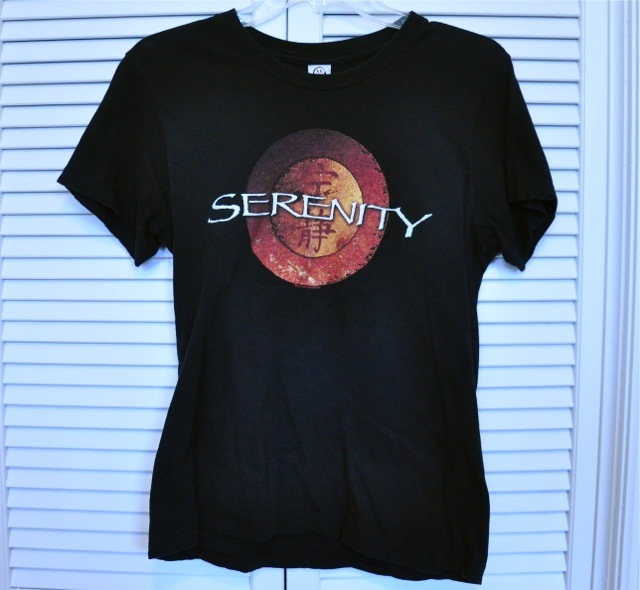 The first thing that popped into my mind when I saw the weekly challenge serenity was my DragonCon T-shirt. “Firefly” is a long time ago now… why do I still have this shirt? Yuck, right? 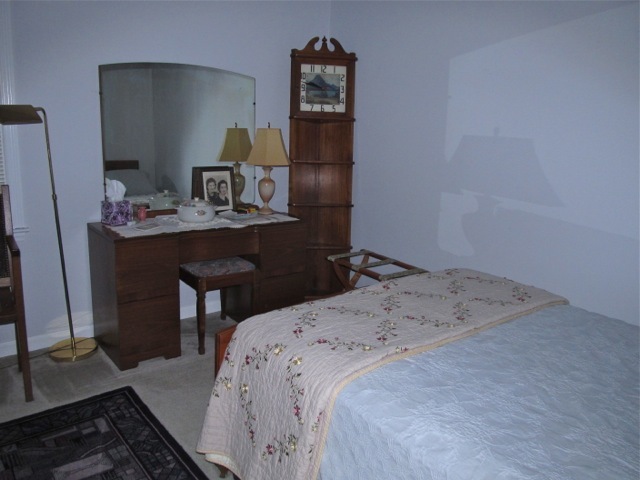 I inherited this walnut bed and dresser from my maternal grandmother. I’ve had it since I was a child. I wanted it to have some color around it. 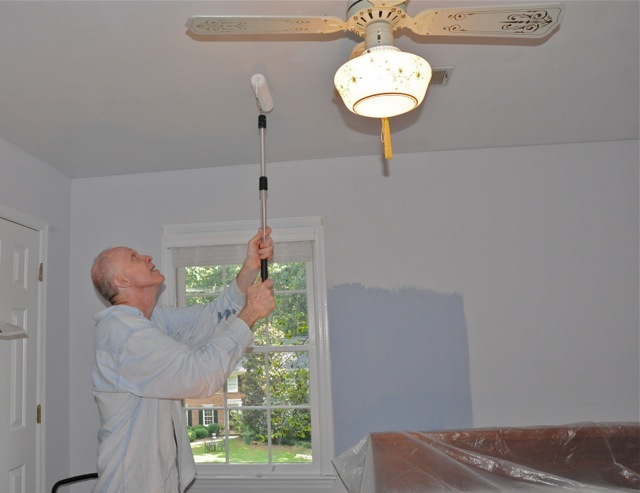 Here’s Sam painting the ceiling for me. Tall guys do ceilings. Short women do walls. The patch of blue is the future for the walls. And, to paraphrase Oscar Wilde: either that ceiling fan goes or I do. Bob used this room as a big closet. He archived his clothing here, including most of the suits and ties he’d ever worn, back (I think) to the 70s, plus the extra khakis he was saving for his retirement. Maybe it’s only natural that I felt like a traitor when I started giving them away. It felt like giving away my last connection to him, but however hard, eventually its the only sane choice. Admission: there may be a few things left in the closet… I must get to that now that I’ve remembered. Once I finally parted with his clothes, I tended to use the room for storage too, just for different stuff. It’s been a useful space to sort out donations, accumulating them until I had a load to deliver. Here it is after I finally finished painting and got it cleaned up and rearranged. 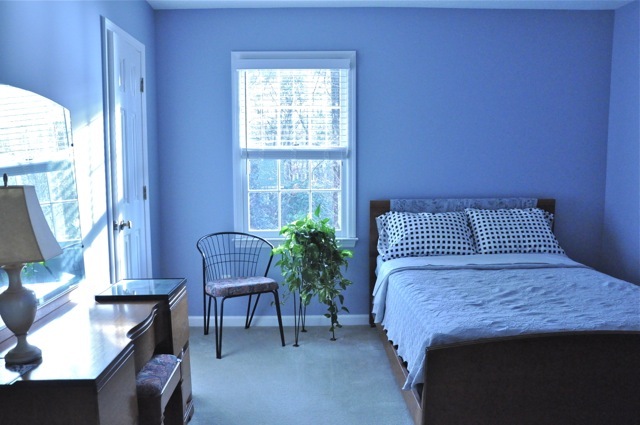 Blue bedroom. Now I need a guest. Total investment: 2 gallons of blue paint, 1 gallon of white paint, time (thank you Sam), and the two blue linen pillow cases that I put over the headboard to lighten it up. Oh wait — and a new white window-blind. As for storage: the books-for-sale bookshelf is to the right, stock still dwindling. What does this have to do with serenity? Well, I was hoping the blue walls would provide some. 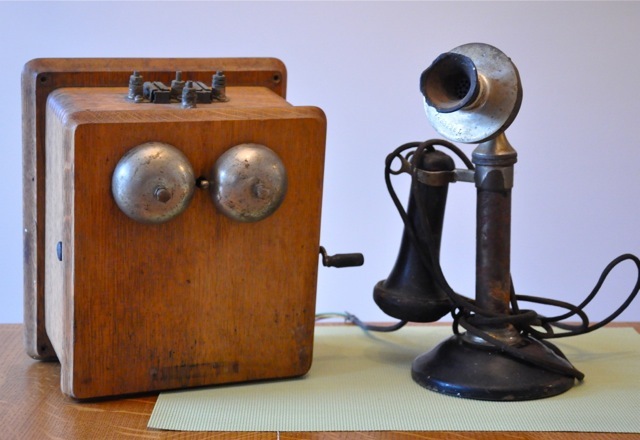 I’m not sure I have all the pieces of this telephone, but these were the basics. It looks so alive — like something Pixar could love. “Luxo Jr” might like to come over to play. The cabinet it once stood on is in my breakfast room now, holding dishes. It still has the little shelf he tacked onto the side to hold the phone. 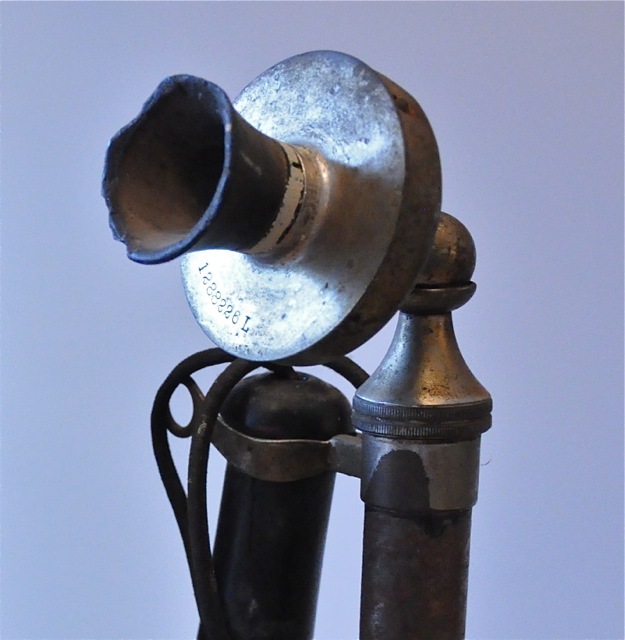 Candlestick phone detail: long before phones evolved to be smart. Too bad it’s suffered some damage. On March 10 1876, Alexander Graham Bell made the now-famous first telephone call. “Mr. Watson — come here — I want to see you,” he said. Too bad there’s no mention of whether Mr. Thomas Watson said, ‘Y’ello?’ when he picked up. Tell me — how do you answer the phone? 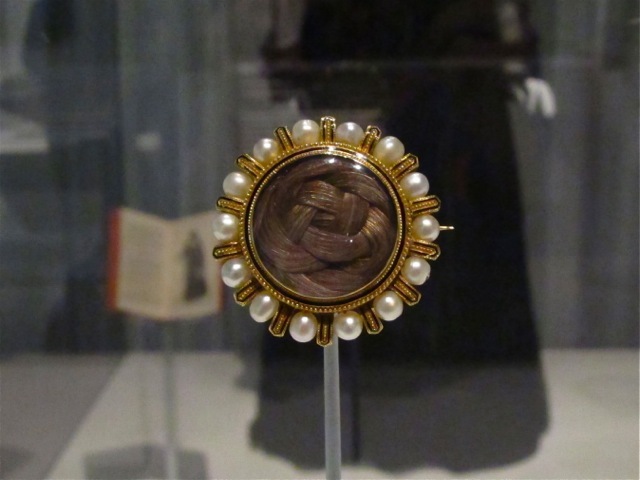 This mourning brooch is made of gold, pearls, black enamel, and hair. Yes, that’s right — hair. 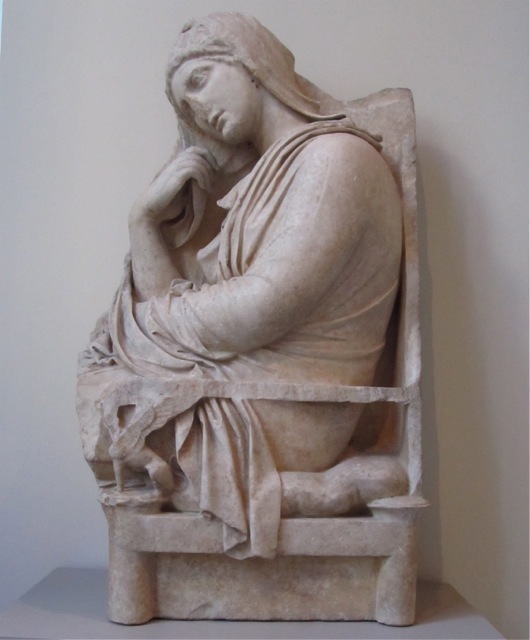 On New York trips our favorite first stop is the Met Museum. 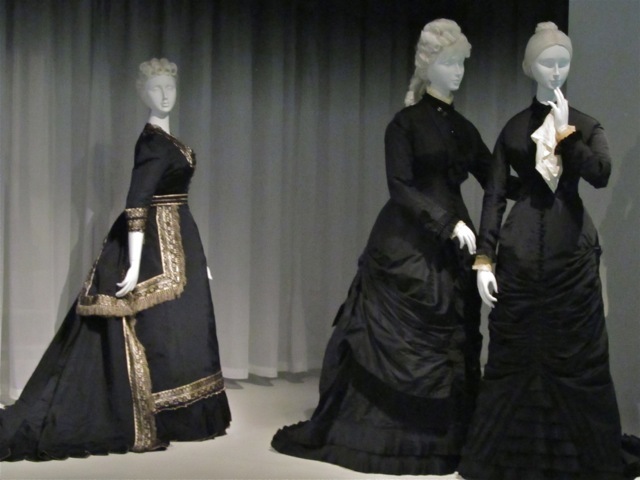 In November, Sam and I checked out “Death Becomes Her: a Century of Mourning Attire” in the Met’s newly remodeled Costume Institute. Mourning Brooch, 1868, Tiffany & Co. Hair was often used in jewelry as a memento of a lost loved one. Most of the clothing on display was for women. In the Victorian era, the century in question, men normally wore black suits, and the addition of a black armband, cravat, or hatband was often enough to qualify them as mourning. Besides that, the proscribed mourning period for men was not as long. The ladies had new black dresses made, or dyed their existing ones (with, by the way, toxic dyes). Something for the stylish mourner. After all that, what a relief to see the gift shop, full of jet black jewelry and… breath mints. 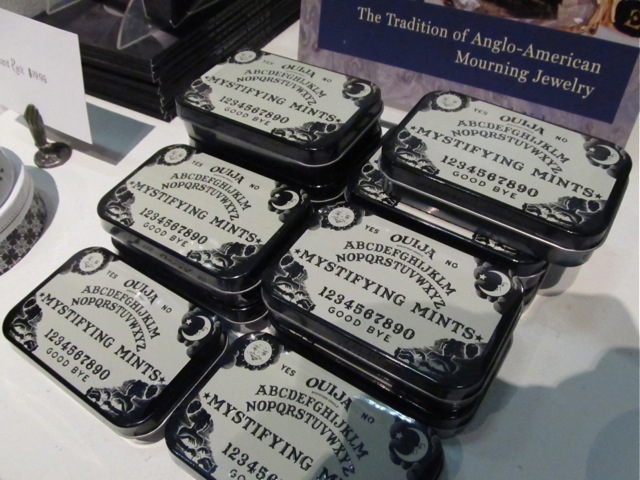 … Mystifying Mints! a la mystifying oracle I presume? Yes, I’m mystified. Next stop, the Greek galleries. I didn’t realize the “mourning” pattern of this tour until later, when I looked at my photos. Here’s just one example. Next day, lower Manhattan: even if I’d known this topic was coming, I couldn’t have done a better job of finding things gone (but not forgotten). 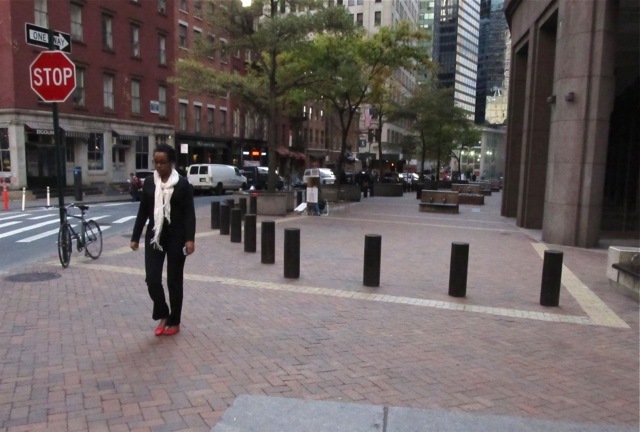 We took a walking tour of New Amsterdam sites, now mostly replaced by history markers. In 1653, New Amsterdam became an official Dutch city. The City Tavern became the Stadt Huys (City Hall). Now City Hall is gone, but the outline of its foundation is marked in yellow bricks. Then on to the old Custom House building, now the Museum of the American Indian. 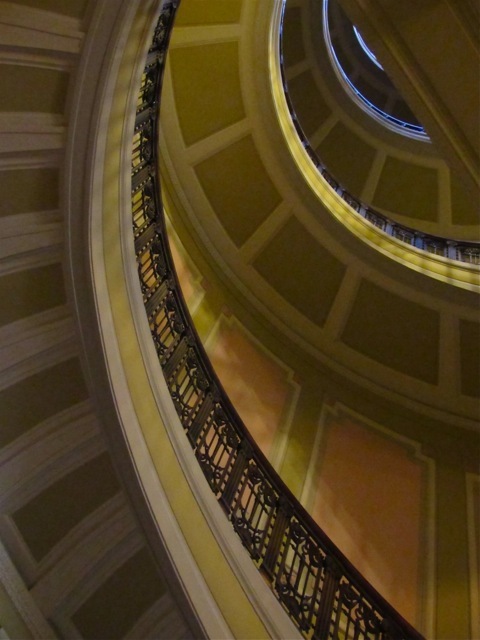 I was feeling a bit mournful myself by that time, and the only photo I took was of this staircase. 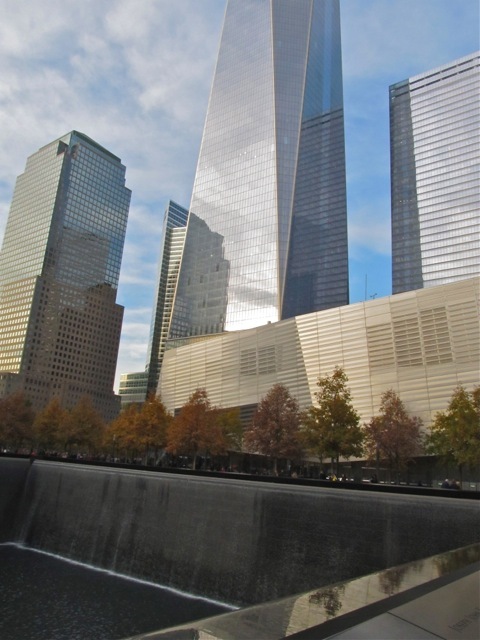 When it was time to head back, we walked past the World Trade Center site. I didn’t know until after we came home that it was the day 1 WTC opened. And of course we also find it hard to let go of their possessions, which is the main reason I started this blog. 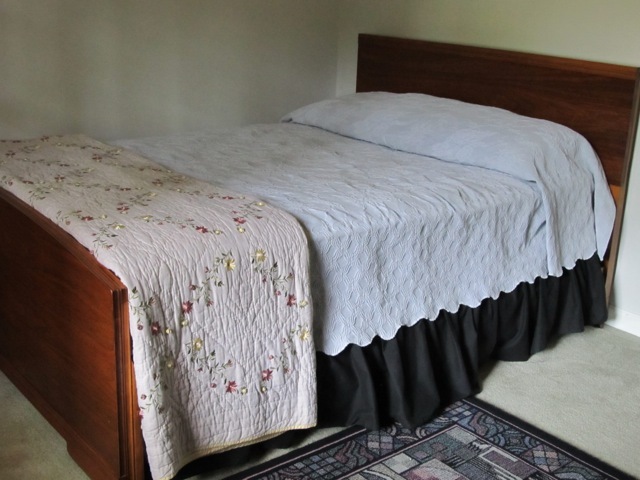 I get letting go of the things mixed up with fear of letting go of the person — this was my mother’s quilt, Bob’s book, my aunt’s chair, my father’s handkerchief — that’s the root of my problems with downsizing. It’s past time I got over that. Life gets better every day, even though some of my loved ones are gone. I shouldn’t need the evidence of all this ‘stuff’ to remember them. Being here is enough, and as long as I am, they’re not forgotten. Now tell me — what do you think of the mourning clothes?